Powers/Abilities: Durham Red is a mutant whose mutation resembles vampirism. She needs to drink blood to live, but does not suffer from the traditional weaknesses of supernatural vampires. While she slept war between humans and mutant consumed the galaxy. Caught in a deadlock that neither side could break, barbarism reigned until eventually, the Pan-Species Accord was founded, creating a raw federation of worlds. While humans remained senior, they begrudgingly accepted the mutants' rights, at least publicly. Twelve hundred years after she went to sleep Durham Red awoke. She discovered that while she had slumbered, she had been turned into a saint by the mutants, while the humans viewed her as a blasphemy. News of her "resurrection" began a new wave of fighting between the two sides. Durham stepped in to end the war, but refused to become mutantkind's living messiah, setting off to explore the universe with a couple of companions instead. 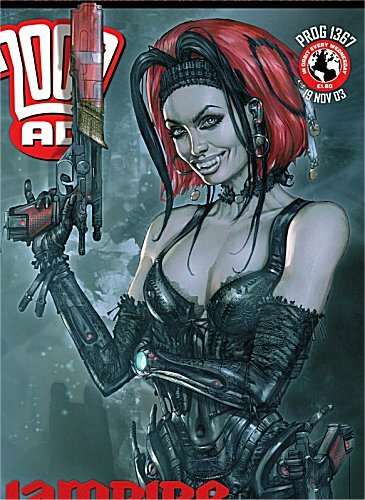 (2000AD Winter Special 1995) - Durham Red went on to become known as the Blood Queen and and became Empress Redwina (and started rewriting history about herself) before either dying or disappearing. She was also married at least three times, and had at least one child. Her family then went on to carry on rewriting history, including assassination of history professors and stealing books, in order to protect the history of Durham Red. 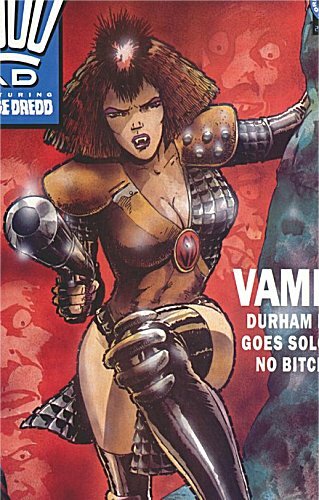 Durham used to work with the likes of Johnny Alpha and Middenface McNulty back when she was a Strontium Dog. Now that they are all long dead she travels with the mutant Jonas Harrow and the human warrior Matteus Godolkin, who believes himself to be in her thrall after she drank from him. Kelvin Green notes "Her current star-spanning adventures take place in what's being called "Knots Landing continuity", because the original Strontium Dog stories she appeared in have since been shown to be false. In order to write new Strontium Dog stories in 1999, long after the character's death, John Wagner decided that the original stories would actually be the legend of Johnny Alpha, as told by the storytellers of that universe. The new stories would be the "truth" about the character, thus leaving open many possibilities, including that he does not in fact die. So just as Knots Landing spun off from the season of Dallas that turned out to be a dream, the current Durham Red series spins off from Strontium Dog stories that have turned out to be just that, stories. It's a happy coincidence that that fits in quite well thematically with the setting of her current series, with its emphasis on legends and how they relate to the reality of the events depicted. The Judge Dredd Megazine ran a short series of apocryphal Durham Red stories, also tying in with the idea."